Although the Election Commission’s announcement on Uttar Pradesh’s polling schedule today introduced a fresh element in the Congress party’s weeklong plans to dismiss the Mulayam Singh Yadav government, the Centre has not closed its options in this regard. The Bihar Government is in receipt of a status report on Naxalism in the country which suggests that Maoists are now concentrating on urban centres. Railway Minister Lalu Prasad on Wednesday said “political vendetta” was the motive behind the Nitish government’s move to challenge his and his wife's acquittal in a case pertaining to assets disproportionate to the known sources of income. Barely a day after the Editors’ Guild issued an appeal against targeting Mr Ramoji Rao, the Andhra Pradesh police has carried out search operations at the offices of Margadarsi Financiers, belonging to the media baron. The Congress Government in the state is bent on implementing reservations to Muslims in educational institutions for the next academic year. "We will definitely implement the reservations for Muslim students this year, after taking into account the guidelines provided by Supreme Court recently," Chief Minister Y.S. Rajasekhara Reddy said. CPM Politburo members, including the party’s general secretary, Mr Prakash Karat, Mr Sitaram Yechuri, Mr M.K. Pande, Mrs Brinda Karat and others, present in the city today, informally discussed about the party’s strategy to be adopted in Uttar Pradesh in the wake of the withdrawal of support by the Congress from the Mulayam Singh government vis-a-vis the announcement of the state’s forthcoming Assembly elections today. The Samajwadi Party’s decision to withdraw support to the UPA coalition is the first major setback for the Congress-led government at the Centre. The SP, with it 38 MPs, is the second largest outside supporter after the 43 MPs of the CPM. The Left’s combined strength in the Lok Sabha is 59. Shiv Sena supremo Bal Thackeray has now set his sights on ‘Black Friday’, the movie based on the 1993 serial bomb blasts which rocked Mumbai. At a press conference here, Thackeray told reporters that the Shiv Sena activists may stop theatres from screening the movie if gangster Dawood Ibrahim was shown to have been portrayed in a positive light. Reflecting the indomitable cross-border longing for peace and kinship, Samjhauta Express, filled to its capacity, left here late tonight for Pakistan amidst enhanced security marking its first journey after the deadly blasts on Sunday. Rattled by the devastating terror attack on the “Friendship Train”, the Railways today announced stringent security measures for the Samjhauta Express, including entry of only bona fide passengers at Old Delhi station, increased RPF personnel on board the train and installing additional CCTVs to monitor passenger movement. Taking measures to tighten security for passengers travelling on the Samjhauta Express, the Railways has decided to have fully-reserved sleeper coaches in the train and not attach general class compartments. Investigative agencies have made a significant breakthrough in the Samjhauta Express blasts by identifying from where the suitcases in which the bombs were planted in the train were brought. Pakistan Foreign Minister Khurshid Mehmood Kasuri made a ''courtesy call'' on Prime Minister Manmohan Singh here this evening and discussed matters of bilateral and regional interest. Expressing serious concern about deteriorating public health in the country over the past seven years, Unicef today warned that a high percentage of around 56.2 per cent of married women in the age group 15-49 were anemic in 2006. The last rites for 10 school-children and two teachers were performed amidst heart breaking scenes this afternoon even as the Kerala Government ordered a judicial inquiry into yesterday's tragic boat accident in Ovungal Kadavu in the Periyar river that claimed 18 lives. A doctor today told a court that the H. S. Sabharwal’s left side ribs were found broken with blood strewn all over and a scar suggesting that he had undergone bypass surgery was also noticed by a doctors’ panel, which performed the autopsy. A person posing himself as an “adviser” to the Prime Minister has been going around presenting visiting cards and sending greeting cards to others describing himself as such. The much talked about movie “Nishabd” starring Amitabh Bachchan today landed in a controversy with the Delhi High Court issuing notice to three producers companies on a suit by another film company alleging that the title of the movie had been copied from their internationally acclaimed art film “Nisshabd”. As many as 125 human bones, including several skulls, were found this morning at a local mission hospital that has been making headlines for the unearthing of skeletal remains of infants and foetuses. The Supreme Court today cancelled the bail of a member of underworld don Chhhota Rajan’s gang in a money extortion case registered against him under the Maharasthra Control of Organised Crimes Act. Five persons, including a Muslim and his wife, were tonight detained for questioning in a coordinated raid by security forces in Rajasthan, Uttar Pradesh and Delhi.Sources said two persons each were held in Rajasthan and UP while one was detained in Old Delhi. The Saudi Arabian government today deported 132 Indians, who imprisoned for overstaying in the country without work permits. They arrived at the Meenambakkam airport today. The government tonight assured Lok Sabha Speaker Somnath Chatterjee of full cooperation in ensuring a smooth conduct of the budget session of the Parliament commencing from February 23. Relatives of train blast victims arrive from Pakistan. King Khan releases Video for KBC’s signature song. A unique collection of collecting stamps, coins and medals. Shivshankar Menon arrives in US. The Congress initiated an “oust Mulayam” exercise soon after the February 14 Supreme Court order on defected BSP legislators on the plea that his government had lost all “moral, constitutional and legal” right to continue in the office. However, its efforts hit a roadblock when the Left parties put their foot down and refused to endorse the imposition of the Central rule. Even as a determined Congress is looking at ways of wearing down the Left’s resistance, UPA insiders maintained that today’s development will help allay the fears of the Marxists who were apprehensive that the Congress wanted to impose President’s rule in UP in order to delay the Assembly elections. The Congress is hoping that it will now be able to bring the Left parties on board. Soon after the official announcement, Prime Minister Manmohan Singh conferred with his cabinet colleagues Pranab Mukherjee, Shivraj Patil, P. Chidambaram and H.R.Bharadwaj to take stock of the changed situation. There is no constitutional bar on the Centre from dismissing the Mulayam Singh government even after the poll announcement but the Congress will have to take a political call on whether it should go ahead with this move. While conceding that the situation has changed after today’s development, the Congress is pressing ahead with its demand that the Mulayam Singh government must go. 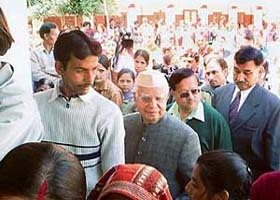 It also remained unfazed by the Samajwadi Party’s announcement of withdrawing support to the UPA. “As long as Mulayam Singh Yadav is the chief minister, there can be no fair and free elections in Uttar Pradesh. This has always been our apprehension and we continue to maintain so,” AICC media department chairman Janardan Dwivedi told mediapersons this evening. He urged the Election Commission and the Centre to take appropriate steps to ensure an impartial poll in UP. On the other hand, there is a section in the party that believes the poll announcement has queered the pitch for the Congress, as it will be difficult to justify the imposition of Central rule six weeks before the elections. “It would have made more sense if the poll schedule had been announced after the imposition of President’s rule. But doing so now will be like putting the cart before the horse,” remarked a senior UP Congress leader. Going by the report prepared by the Union Home Ministry, 395 police station areas in 91 districts of 11 states were presently affected by Left-wing extremism. In 2006, at least 1,506 incidents of violence took place and 521 civilians and 167 security personnel were killed. Bihar accounted for 40 fatalities — 16 civilians, five security force (SF) personnel and 19 Maoists. The report cautioned the Bihar government against the slow but steady spread of Left-wing extremism in urban pockets, including Patna. It was learnt that the Maoists were in a process of making a “qualitative penetration” across the 38 districts of Bihar and had launched a “socio-economic investigation” in places, both where their movement is strong and also in targeted areas, to identify new issues faced by people. Sources said the “social investigation” was believed to be aiming at redefining the strategies and field-level tactics by the Maoists. They were verifying some inputs, which indicated investments by the Maoists in real estate to generate money to sponsor their subversive activities. The intelligence inputs also cautioned against the possible attempts by the Maoists to organise another jailbreak on the lines of the Jehanabad jailbreak of 2005. But this time, it is the Beur jail which is reportedly on target of the Maoists, as their top leader Ajay Kanu was now lodged here. The Bihar Police arrested Ajay Kanu, who masterminded the Jehanabad jailbreak, a fortnight ago from the West Bengal-Bihar border. Besides, the recent inputs from the Sashastra Seema Bal(SSB) expressed concern over the possible sudden stepped-up Maoist violence in North Bihar along the Indo-Nepal border, as the firearms,until now possessed by the Nepali Maoists, were reportedly finding their way to the Indian side. A senior official of the SSB told The Tribune that after the installation of a democratic government in Nepal and the likely participation of the Maoists in it, the Nepal Maoists are unlikely to surrender the entire firearms they had bought at high prices before the international peacekeeprs. Sources said that a large portion of those firearms were reportedly now being sold either to Indian Maoists or to Pakistan-sponsored ISI subversives. Both Mr Lalu Prasad and Ms Rabri Devi were acquitted on December 18 by the CBI court on charges of amassing Rs 4.6 million between 1990 and 1997, disproportionate to their known sources of income. But, the NDA government in Bihar on February 19 challenged their acquittal. Talking to mediapersons after flagging off the new Patna-Ahmedabad Azimabad Express train at the Rajendra Nagar terminal here today, Mr Lalu Prasad said: “Its (Bihar Government) desperation to target me and my wife shows that there was a motive of political vendetta”. The RJD supremo, however, claimed that he had full faith in the judiciary, which would foil all designs of the Nitish government to mentally harass him and his wife. Meanwhile, the Patna High Court on Wednesday adjourned the hearing on the Bihar government’s petition challenging the acquittal of Lalu-Rabri till March 20. Justice R. K. Dutta adjourned the hearing at the request of Special Public Prosecutor Akhileshwar Prasad Singh, who was recently appointed by the Nitish Kumar government to handle the case. The petition was filed on the recommendation of state Advocate-General P.K. Sahi. Mr Sahi told The Tribune that there was sufficient legal ground to challenge the order of the designated CBI judge. Polling for the 69 Assembly and one Teri Lok Sabha seats in Uttarakhand concluded peacefully this evening barring a few minor incidents of skirmishes and protests over non-functioning electronic voting machines (EVMs). The polling recorded a turnout of over 55 per cent voters till reports last came in. It is likely to cross 60 per cent when all inputs are available from far-flung areas sometime tomorrow. State’s chief electoral officer N. Ravi Shankar said the poll was by and large peaceful with reports of minor scuffles and stone-throwing over the suspension of vehicular traffic in the Rudrapur Assembly segment. There was some initial problem with EVMs in Udham Singh Nagar, Haridwar and Dehradun. This was due to some human error and technical failures, he said while adding that the problems were rectified within a few minutes. The Teri Lok Sabha poll recorded a little over 48 per cent polling which is close to the 48 per cent recorded in the previous Lok Sabha poll. Principal secretary home, N.S Napalchyal said, “special arrangements have been made to airlift the presiding officer and EVMs from for polling stations in Bageshwar and one in Pithoragarh districts. The voting in remote areas of the state touching the Nepal and China border have been moderate, as expected because people have to trek long distances to the polling stations. The election was fought on the issue of development, which incidentally became the main plank for both the BJP and Congress. In the 45 hill constituencies of Uttarakhand, migration of youths seeking jobs and women’s demand for curbing the distillation and use of liquor became the major issues. While in the 25 Assembly segments in the plains, besides curbing the use of liquor, development, curbing rising prices and boosting the state’s economy through development were the main issues. The poll to the Bajpur Assembly segment in the Udham Singh Nagar in the Terai region, which was adjourned due to the death of a Congress candidate, will now take place on March 25. The counting of votes polled today will take place on February 27. A team of state crime investigation department (CID), led by Inspector-General Krishnaraju, simultaneously conducted the search operations at Margadarsi offices located at Saifabad, Fetehmaidan and Basheerbagh. However, the sessions court, on an application by Margadarsi, issued orders later in the evening to cease the search operations till Thursday afternoon. The Rajasekhara Reddy government had issued an order on December 19 authorising Mr Krishna Raju, IG, CID, to file applications in courts of jurisdiction and to take action against Margadarsi Financiers. The move comes a week after the Rangachari committee, which was appointed by the Congress government, submitted the report, 'establishing' that the financiers had been violating provisions of the Section 45 S of the RBI over the past few years. The opposition parties, including the TDP, the TRS and the CPM, reacted to the search operation. “The search operation is nothing but vindictive and vengeful acts by the Congress government. It is unfortunate that the rest of media in the state appears to be unperturbed by the attacks on Eenadu group. They should realise their turn might come soon”, Mr N. Chandrababu Naidu, TDP chief, said. General secretary of the TRS Prakash said the move was malicious as there was not a single complaint by depositors despite provocations from the government. Calling the move as a classic example of victimisation, the CPM legislature party leader N. Narasimhaiah questioned the motive of the government in targeting the company when it failed to act against several urban banks that had actually cheated depositors. The Congress Government in the state is bent on implementing reservations to Muslims in educational institutions for the next academic year. "We will definitely implement the reservations for Muslim students this year, after taking into account the guidelines provided by Supreme Court recently," Chief Minister Y.S. Rajasekhara Reddy said. Speaking after inauguration of the Mushaira Shaam-e-Nagma seminar here, Reddy indicated that the reservation percentage for Muslims might be reduced as the apex court had put a cap of 50 per cent on quota. The Andhra Pradesh government enacted legislation in 2005, providing for 5 per cent reservation for Muslims under a new category of the Backward Classes. However, the Andhra Pradesh High Court had struck down the act as unconstitutional and as a violation of Articles 15 (4) and 16 (4) of the Constitution. The Chief Minister alleged that the implementation of the process was delayed because the opposition parties approached courts. Minister for Information and Public Relations Mohammad Ali Shabbir, speaking separately to reporters, said that the government was seriously exploring all available legal options to implement reservations for Muslims. The minister said that the principal secretary to Chief Minister Jannat Husain was entrusted with the task of finding a way out of the present impasse. The government has been consulting legal experts such as Fali Nariman and S. Venugopal in this regard, he disclosed. The Supreme Court by an interim order on January, 2006, declined to stay the operation of the judgment and posted the matter for hearing by a five-Judge Constitution Bench. "We are considering alternatives such as reducing the percentage of reservation to 4 or withdrawing the special leave petition in the apex court and issuing a fresh ordinance taking into account the observations made by the high court," the minister, a close confidante of the Chief Minster said. The state government had implemented the reservation for Muslims for the year 2005-2006. Last academic year, the Supreme Court refused an application of the state government to issue directions to implement Muslim reservations in educational institutions. Presently, reservations for the Scheduled Castes, the Scheduled Tribes and the Backward Classes in the state account for 46 per cent. The elections would be held in seven different phases in the 403 Assembly seats in Uttar Pradesh, starting from April 7. These politburo leaders were here for attending the funeral of the CITU’s general secretary, Mr Chittabrata Muzumdar, also a Rajya Sabha MP who died yesterday after a protracted illness. The body was handed over to the N.R.S hospital authorities as desired by him for conducting the research work by the medical students. The Samajwadi Party’s decision to withdraw support to the UPA coalition is the first major setback for the Congress-led government at the Centre. The SP, with it 38 MPs, is the second largest outside supporter after the 43 MPs of the CPM. The Left’s combined strength in the Lok Sabha is 59. The decision of the Mulayam Singh Yadav-led party has not taken the Congress and the UPA leaders by surprise as it has come over a month after the Congress withdrew its support to the Uttar Pradesh Government. The Congress, after withdrawing support to the Mulayam Singh government, had launched a bitter attack on the performance of the state government. Earlier, K. Chandrashekhar Rao-led TRS was the only constituent of the UPA which had quit the coalition a few months ago on the separate Telengana issue. Barring this the ruling alliance had remained intact despite a lot of bickering and differences between the Left and the rest of UPA partners. The status of the MDMK is still not clear. Shiv Sena supremo Bal Thackeray has now set his sights on ‘Black Friday’, the movie based on the 1993 serial bomb blasts which rocked Mumbai. At a press conference here, Thackeray told reporters that the Shiv Sena activists may stop theatres from screening the movie if gangster Dawood Ibrahim was shown to have been portrayed in a positive light. "I will see the film in a couple of days and if Dawood Ibrahim has been shown in a positive light, we will ensure that theatres do not screen the film." The film is presently being screened in theatres across the country more than two years after it was made. Based on the book of the same name by journalist Hussain Zaidi, ‘Black Friday’, produced by Mid-day Multimedia, was in cold storage after those accused in the blasts case had sought a stay on the release of the film. The Shiv Sena supremo, however, felt that his nephew had spurned his earlier offers. "Some of the comments he has passed on Uddhav are not right." It was a different Friendship Train which chugged out of platform No 18 of the Old Delhi Railway Station one hour 45 minutes behind schedule, reduced number of coaches from 14 to ten, no unreserved compartment and strict check of passengers and baggages. However, one thing neither security nor the blasts could alter was the heavy rush of passengers and the desire to meet near and dear ones on both sides of the border. Railway Minister Lalu Prasad himself was present at the station to see off hundreds of travellers and oversaw the security arrangements. Over 700 passengers, both Pakistanis and Indians who left for Attari half an hour past midnight—as against the normal departure time of 10.50 p.m. — were undeterred by the backdrop of Sunday’s terror attack on the train which left 68 dead near Panipat. In the wake of the Sunday midnight blasts, unprecedented security arrangements were put in place tonight at the station and passengers had to cross a four-layer check before boarding the train. No one other than those with a valid travel documents and tickets was allowed to enter platform No. 18, where CCTVs caught on camera the movement of each and every person. The Railways had deployed two security personnel and a ticket examiner in each of the ten compartments as part of the beefed up security measures which was reviewed by the Railway Minister an hour before its departure. People stood in long queues in front of the ticket booking windows at the station for the journey, That, coupled with stringent security, was the main reason for the train’s delayed departure. Tight security did cause inconvenience to the passengers but none seemed to mind it as they said it was necessary in the wake of the twin explosions. “We are not going to take any chance for future trips of the Samjhauta Express,” a top official of Northern Railway told UNI. He said nobody, not even the relatives of the passengers, would be allowed entry inside the station. From now onwards, the entire train will be fully reserved and no unreserved passenger will be allowed to board it. Among the other security measures put in place for the train that links India and Pakistan are deployment of additional Railway Protection Force (RPF) personnel, dog squads and a thorough screening of the luggage carried by the passengers. “We have advised passengers to travel light because it is only an overnight journey. We have also asked them to arrive at the station well before the departure of the train for a proper verification of their travel documents and luggage,” he said. The official said the entire station as well as the train would be sanitised and lot of checks would be carried out. Even police officials posted at the station and the RPF personnel escorting the train would have to undergo stringent security checks. According to a Railways spokesperson, the Delhi-Attari Samjhauta Express will be fully reserved with eight second class sleeper coaches from today. He said reservation of the train had been made available on the passenger reservation system and could be obtained from four specified counters at the reservation office in Delhi. He added that passengers bound for Pakistan with valid visas could avail of the reservation 15 days in advance. The Railways has also decided to allow only passengers with valid tickets on the boarding platform at the Old Delhi station. ''The investigation is going on in full swing and we have identified from where the suitcases were brought,'' Home Ministry sources said here today. The suitcases filled with the low-intensity high heat and temperature generating timer bombs were left in the Attari-bound train which exploded about one hour after the train left the Delhi station. They, however, refused to comment whether Pakistan-based Lashker-e-Toiba was involved in the blasts which claimed 68 lives, including many Pakistani nationals. Meanwhile, home secretary V.K.Duggal today discussed the progress of investigations with the Delhi police commissioner K.K.Paul and the Director Intelligence Bureau. The investigative agencies are investigating a call made to the Pakistan Occupied Kashmir just after the blasts. ''It was just a courtesy call,'' an official of the Prime Minister's Office (PMO) said. Mr Kasuri also apprised the Prime Minister about the discussions he held with External Affairs Minister Pranab Mukherjee earlier during the day. It was not immediately clear whether Mr Kasuri had renewed the invitation to the Prime Minister to visit Pakistan. The Pakistan Foreign Minister, who arrived here yesterday to co-chair the Fifth India-Pakistan Joint Commission Meeting and hold talks with the External Affairs Minister, will call on former Prime Minister Atal Bihari Vajpayee and former Deputy Prime Minister L.K.Advani tomorrow. He is also scheduled to meet Hurriyat leaders, including hardliner Ali Shah Geelani. While Assam was the worst affected with 72 per cent of its married women suffering from anemia, Haryana came second with 69.7 per cent and Jharkhand third with 68.4 per cent. The National Family Health Survey-III, brought out jointly by Unicef, the United Nations Population Fund, Britain’s Department of International Development and Avahan, an initiative of Bill and Melinda Gates Foundation, said 79.1 per cent children between the age of 3-6 years were anemic in 2006 as against 74.2 per cent in 1998-99. “There is more than one reason for this development. Low social status of women, poor food quality, high cost of healthcare facilities and even some genetic problems are responsible for the problem,” observed Mr Werner Schultink, chief of child health and nutrition, Unicef India. Prevalence of malaria in states like Assam was also responsible for women and children been anemic. Unicef officials said the situation among the children had worsened in 16 states in the country in the past seven years. Topping the states affected severely by the blood shortage syndrome was Andhra Pradesh where 79 per cent of the children were suffering from anemia. Rajasthan came next with 79.8 per cent, followed by Karnataka and Madhya Pradesh. Nearly 63.2 per cent children in the 3-6 age group and 43.4 per cent women between the 15-49 age group were anemic in Delhi. Besides, there was a high percentage of women who were underweight. The funeral of the remaining six victims will be held tomorrow. The bodies were kept at Little Flower Hospital in Angamaly near here. Kerala Chief Minister V S Achuthanandan ordered a judicial inquiry into the boat accident and also announced ex-gratia of Rs two lakh each to the next of kin of the deceased. Speaking to reporters after visiting the Angamaly St Antony's School where the bodies were kept for the public to pay last respects, Mr Achuthanadan ordered the probe to determine the circumstances leading to the tragic incident. He said the probe would look into factors like boat safety and the timing of the picnic party to visit the Thattekkadu Bird Sanctuary by boat. One of the doctors on the panel, Dr P. N. Verma, at present with the local civil hospital, told this to the court of district judge Anil Kumar Sharma as prosecution witness in the case. Sabharwal died after allegedly being manhandled by an angry crowd, including Akhil Bharatiya Vidayarthi Parishad (ABVP) activists. The incident took place in the wake of the cancellation of the Madhav College students union poll on August 26 last year. The panel opined that he died of “syncope” (to faint due to low blood pressure), he said, adding that no external injury marks were found on the body. Asked about the chances of the ribs getting fractured due to cardiac massage, doctor Verma did not rule out the possibility. The action of one Dr M.V. Rao has come to the Prime Minister Office’s notice which has asked the agencies concerned to take necessary action. “It has come to the attention of the PMO that one Dr M.V. Rao has circulated visiting cards and greeting cards describing himself as adviser to the Prime Minister. This is to state that there is no such adviser to the Prime Minister,” media adviser to the Prime Minister Sanjaya Baru said. The producers, RGV Films, Adlabs Films and Super Cassettes Ltd, were directed by Justice A.K. Sikri to submit replies by February 23. The Knungo Media Ltd, which had produced “Nisshabd” with financial aid from the government of France in 2002 and cleared for release by the Censor Board in June 2005, moved the suit against infringement of its property right and sought immediate stay on the release of the new movie. The administration today ordered the cleaning of the tanks which led to the fresh discovery. Between Saturday and Monday, 444 bones were found. The first excavation yielded 392 bones that belonged to at least 14 infants or foetuses. The interim bail granted to Vinod G. Asrani, Chhota Rajan’s gangster, was cancelled by a bench of justice A.R. Lakshmanan and justice Altamas Kabir. The court, after examining the entire record of the case, said there was no need to interfere with the Bombay High Court order that earlier rejected the bail. Five persons, including a Muslim and his wife, were tonight detained for questioning in a coordinated raid by security forces in Rajasthan, Uttar Pradesh and Delhi. Sources said two persons each were held in Rajasthan and UP while one was detained in Old Delhi. A man and his wife detained at Naya Sahar locality of Bikaner following a raid by the army and Rajasthan police, Bikaner Superintendent of Police Ashok Rathore told PTI in Jaipur. 44 persons were from Tamil Nadu and the rest were from Kerala, Karnataka, Andhra Pradesh and Maharastra, airport sources said.